When I first began writing this blog in the spring of 2011, my Richmond Spiders were a frequent topic of choice. That March, the Spiders went on a run to the Sweet 16 of the NCAA tournament, thanks in large part to 6'10" senior Justin Harper. Harper was chosen by the Cavs in the second round of that year's NBA draft, but then I pretty much forgot about him. I had to go to Wikipedia just now to find out that besides appearing in 14 games for the Magic in 2011-12, Harper has played in the D-League, France, Israel and Italy. 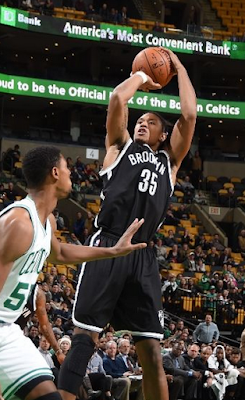 Last night, the Nets were without six of their regulars for their exhibition visit to the TD Garden. As Brooklyn's starting lineup was announced, I was shocked to hear: "From the University of Richmond, Justin Harper." Harper played 27 minutes, shot 5-for-9 from the floor (and 3-for-5 on threes), scored 14 points and grabbed six rebounds. He was arguably the best Net on the court, posting a team-high plus/minus of +9.